This is just one of our ways to enjoy our stash of Hatch Green Chili. 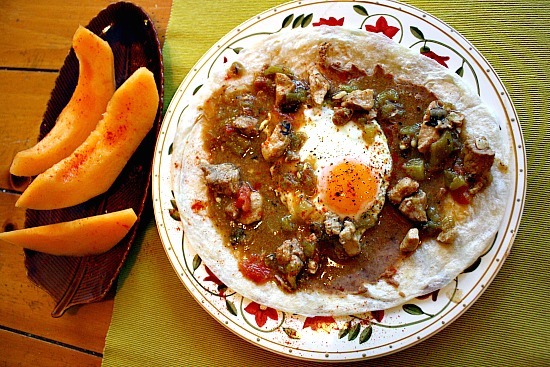 Green Chili and Eggs with refried beans on a flour tortilla, you’ve got a killer Southwestern breakfast. Remember all those containers of Colorado Style Hatch Green Chili that I’ve hoarded in my freezer? I have about fifteen of them that hold about two cups each. I’ve also made a couple large batches of refried beans and divided those into small freezer containers. Grabbing one of each and simply thawing them out in the refrigerator overnight and the next morning we’re enjoying an easy to prepare Southwestern breakfast. Here’s how. Fry up an egg until it’s done to your liking, we prefer over easy. While the egg is cooking heat up the containers of chili and beans in the microwave until hot and steamy. Set aside. When the egg is done, heat up a flour tortilla in the microwave for about thirty seconds. Smear a heaping tablespoon of refried beans over the tortilla, place your egg in the middle and top it with a helping of green chili. Sided with some fruit you have an easy, quick Southwestern Breakfast. This is one of our favorite ways to enjoy our stash of Hatch Green Chili. In the meantime, let’s talk about fall colors. I had some miscellaneous fresh Colorado chile peppers in the crisper that needed to be used. The jalapeno’s had kept their brilliant green color, a few other varieties had turned a bright red, a couple had taken on an orange hue and some were gold and yellow. I threw them all on a baking sheet, broiled them, turning until charred, and placed them in a plastic bag to steam. The skins pretty much fell off, only a couple of spots needed a knife to clean them. Never use water to remove peels from charred peppers, it washes off a lot of the flavor. I chopped them up and ended up with this fabulous plate full of brilliant fall colors. And just another version of Green Chile with Eggs, without the pork. I put the chilies into a sauce pan, added a couple cups of chicken broth, a teaspoon or more of cumin, a shake of Mexican Oregano and some finely chopped cilantro leaves and let it simmer for about fifteen minutes. 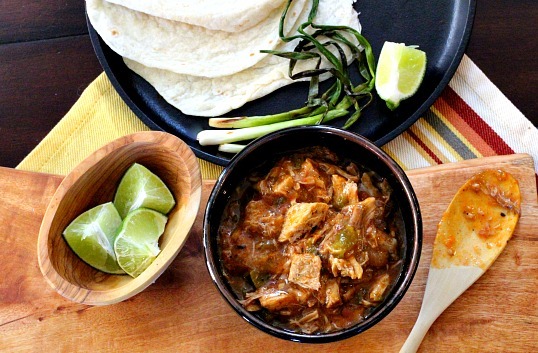 Mexican Oregano is a must have if you’re serious about Southwestern and Mexican cooking. I’ve included an affiliate link for your convenience. Using some of the chilie’d broth thickened with some flour, adding some salt and pepper, I adjusted seasonings and I had some quick green chili for a breakfast of green chili and eggs. Sided with some oven fries, a small tomato that has somehow survived on the kitchen counter, a warmed flour tortilla and finished with a sprinkle of Mexican crumbling cheese we had a wonderful meal. We’ve had a beautiful Fall with mild temperatures, so after breakfast we leashed up the dogs and headed out for a walk. Leaving our neighborhood we walk the path up the hill through the open space. On this clear day we had a nice view of Downtown Denver. 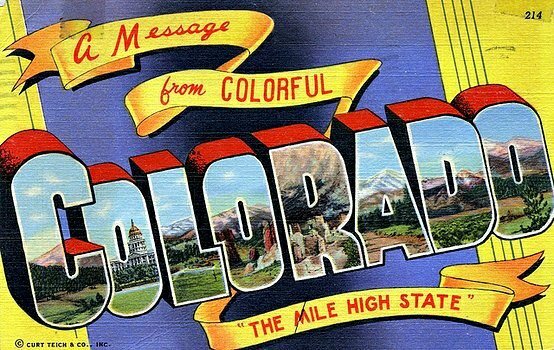 Most of our open space areas have been left in natural Colorado prairie grasses and brush. The copper grouping in the center is Scrub Oak that you’ll find blanketing the hillsides along the front range. Along the path, some not so native small trees were showing off. And heading down the hill we have a nice view of Mt. Evans tipped with white from our first snow fall. Hatch Green Chili and Eggs …It’s What’s for a Fall Breakfast. Sometimes the best dishes are the ones made out of necessity. I don’t know how it could get much better that a bunch of roasted red peppers. I am so glad you took advantage of the beautiful fall colors and took some photos. I don’t think about it until I am on the road and my camera is at home. I still haven’t gotten my camera back Karen…these were taken with my little point and shoot. It does pretty good when there aren’t lighting issues. LeaAnn this is a perfect dish! The flavors are fantastic and it’s so beauitful to look at. Loved your fall views too! Thanks Toni … always good to hear from you. Beautiful fall colors inside for breakfast as well as outside. Well nothing like your part of the U.S. but we do have some pretty scenery this time of year. Looks like fall has arrived, as it has here. I had a breakfast post queued up for tomorrow, but after seeing this great one, I may just delete it. I love all of the peppers cooked like that. I love fall colors. Where I live, most of trees stay green. We don’t see wonderful red or orange or brown. You’ll have to visit the Eastern part of our United States some time. Now that’s spectacular at Fall. I have some peppers in the fridge too and this would be a great direction to take with them. I enjoyed the photos of the scenery too. So often here in Colorado we forget to stop and enjoy the gorgeous view, thanks for sharing it! Thanks for the comment Holly. We do live in a beautiful area and I agree, sometimes I have to stop myself to remind of my surroundings. Highland Ranch has some magnificent views, Lea Ann! The natural state of the open spaces is beautiful. I also love eggs cooked with chili or salsa. I usually add a sliced avocado on top. Thank you for all your kind words of support for the Hurricane Sandy victims. I have been voluteering at a temporary shelter In Brooklyn the past few days for people that lost their homes. It is wonderful to see how many people are helping and donating goods that are so dearly needed. Where on earth was my avocado?????? I always have one in my kitchen. Must have forgotten. 🙂 Pat, I was somewhat hesitant to post this with all the devistation on the East coast. We’ve been so lucky with our mild weather. 🙂 doesn’t it look good? What a nice breakfast – I love all that colorful food. (color=healthy) Those fall shots are magnificent – makes me want to get out with my camera. It’s been mild here and we’re having a breathtaking fall. The shot of Mt. Evans is spectacular! I miss seeing your photos on your blog. You’re a much better photographer than I. Get it out and start shootin. Gorgeous photos and delicious southwest breakfast recipe! Wow that is my kind of breakfast, absolutely wonderful. “Never use water to remove peels from charred peppers, it washes off a lot of the flavor,” thank you!! perfect breakfast! So glad you commented on this Vianney.